What if you knew exactly what to do (and what NOT to do) to easily inspire feelings of love and devotion in a man and trigger his masculine need to commit to you - and painful feelings of worry, doubt, anxiety and insecurity from wondering what a man's thinking or how he feels about you were gone forever? 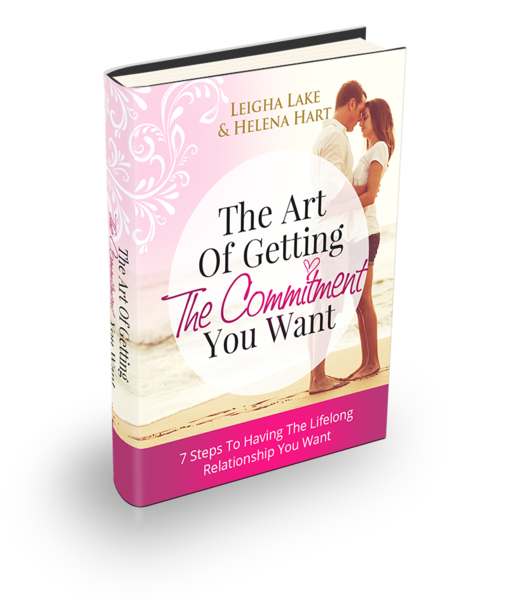 When you understand how the process of commitment really works in the mind of a man (it's very different than how it is for women), getting all the love, attention, tenderness, romance, connection and commitment you want will be SO much easier than you ever imagined! If you're struggling and frustrated because your relationship doesn't seem to be moving forward - or you keep attracting men who don't seem interested in a real committed relationship - you're not alone. If you don't learn how relationships and commitment REALLY work for a man, you'll keep wasting your precious time and energy accidentally doing what doesn't work and sabotaging your efforts. Does any of this sound familiar? If so, then this is probably the most important information you'll ever learn when it comes to having the loving, committed relationship you want. When we find ourselves feeling anxious about where we stand with a man or where the relationship is going – it’s normal to start to worry that if we don’t show him how interested we are, he’ll think we don’t care or he’ll lose interest and drift away. We automatically begin trying to let him know how interested we are, and the things we instinctively do unknowingly turn a man off! We want to make sure he knows how we feel. We feel this intense “urge” to do things for him to show him how much we care. We’re just being friendly and loving… and we do these things because we want to show him how cool, easy going and helpful we are. We may think we actually need to “help” him. He may be shy, busy, or just clueless – and we want to make it as easy as possible for him and show him what a great woman we are. We take on the masculine role as “pursuer” without even realizing it – and this automatically forces him into the “distance-er” role. To a man, when we begin initiating anything – it feels like pressure to him. It dampens his desire to get closer – and he often has NO IDEA why. He probably can’t put his finger on it, but he just isn’t “feeling it” the way he used to. He may stop calling or making plans with you – or even start saying he’s “confused” or doesn’t know if he can give you what you want. As women, when we talk things through, it helps us feel more connected and closer. To a man, it feels like pressure and it feels like we’re chasing him. The only thing talking about the relationship makes a man want to do is back up and create space for himself – which makes US want to move towards him to close the gap, as soon as possible. Typically when we want to talk to our man about the relationship it’s because we’re starting to feel anxious about losing him. It may feel like the commitment we want is slipping through our fingers. Here’s the thing – you don’t need to talk about the relationship. The less you initiate talking about the relationship (including asking him how he feels about you), the better! When you want to talk about the relationship, he’ll usually shut down and his feelings of attraction will start to fade instantly. Inspiring A Man To Want To Commit To You Has NOTHING To Do With The Words You Say! If communication is the “key” to intimacy, how could talking about the relationship push a man away? It’s the way we instinctively go about it that makes him automatically lose attraction. What you want to do instead to bring your man closer and create a deep connection is to focus on creating good feeling experiences with him - moment by moment. When you learn what makes a man want to get as close as possible and stay forever - you'll find yourself feeling more happy, secure and confident. You’ll no longer spend your precious time worrying about how a man feels about you or what his intentions are. You’ll feel more cherished and connected to him right away, because HE'LL feel compelled to move towards you and close that gap. If you don't learn what makes a man want to get as close as possible and stay in love forever, you’ll find yourself endlessly waiting for him or wondering how he really feels about you (and if there's anything you can do to get him to give you the love you need). You may even feel great when you’re with him - but when you’re NOT with him, you may feel anxious and insecure and start analyzing his every word and action (and unknowingly give these things the wrong meaning). What you're about to learn can completely transform your love life and get you the commitment you want. It might feel counter-intuitive at first, but once you implement the tools and get incredible results, you'll never go back to doing things the "old" way! There's one shift that transforms everything - instantly! This is NOT about playing games, giving a man an ultimatum, or implementing superficial "strategies." What you need to do is completely shift the relationship dynamic, which is the only way to get permanent results. Rather than "waiting" for a man to make up his mind about you (which means you're at his mercy), it's about shifting the dynamic so YOU'RE the prize and you're the one choosing - not the other way around. Once you start implementing these tools, you're going to feel less urgent, more peaceful and back to your empowered, confident self. You'll finally get the commitment you want and experience what it feels like to not have to work hard for love, while your man comes closer than ever and moves the relationship forward all on his own - because it will all be HIS idea! Instant access to all 4 audio classes - this is everything you need to get the commitment you want! These recordings are conveniently broken up into 4 one-hour classes that you can listen to on your computer, smartphone, or tablet - even when you're on the go! A 45-page eBook that details all of the concepts and tools covered in the program! • You've been dating one particular man and you want him to take the relationship to the next level. • You seem to attract men who come on really strong in the beginning, but pull away or disappear when things start to get serious. • You want to create a deep heart-to-heart connection with your man so he sees you differently than any other woman - and can't wait to make you his forever! 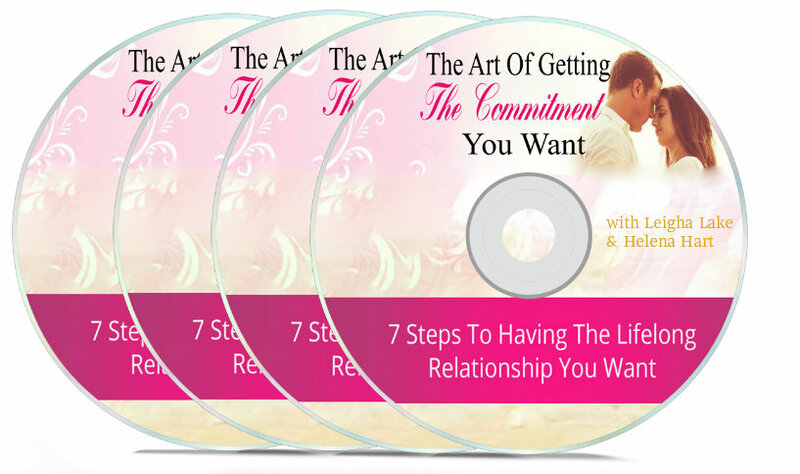 Click the button below to order "The Art Of Getting The Commitment You Want" at the special sale price - you can use a credit card, debit card, or Paypal (it's easy, safe and secure) - and your access to the eBook and audio recordings will be EMAILED to you instantly!